The fifth edition of the International Reggae Festival Overjam has just ended. It has seen 15 thousand people from 25 different countries, it is a very positive response both from audience and artists. Great satisfaction also for the local authorities and organizators. As a matter of fact, right after the closing, new dates for next year have already been disclosed: from the 16th to the 19th August, with the usual pre-party on the 15th. This year the Festival in Tolmin has welcomed more than 100 artists, among them the Jamaicans: The Congos, Tarrus Riley, Kabaka Pyramid, Assassin aka Agent Sasco and the Queen of Reggae Marcia Griffiths. 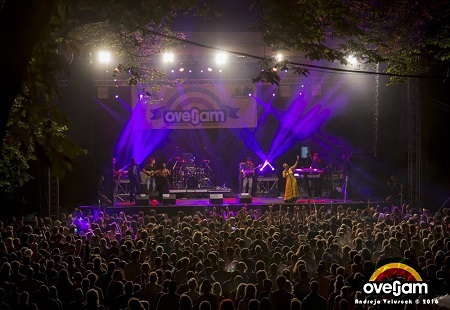 La quinta edizione dell’Overjam International Reggae Festival si è conclusa con la cifra record di 15mila presenze da 25 paesi e una risposta molto positiva da parte di pubblico e artisti ma anche con grande soddisfazione delle autorità locali e degli organizzatori stessi. Di fatto, non appena terminato l’evento, sono state annunciate le date per il prossimo anno: dal 16 al 19 agosto, con un preparty il giorno 15. Quest’anno sono passati per i vari palchi di Tolmin (Slovenia) più di 100 artisti, tra cui i giamaicani The Congos, Tarrus Riley, Kabaka Pyramid, Assassin aka Agent Sasco e la “regina del reggae” Marcia Griffiths.